Ruth Stone Foundation Reading feat. 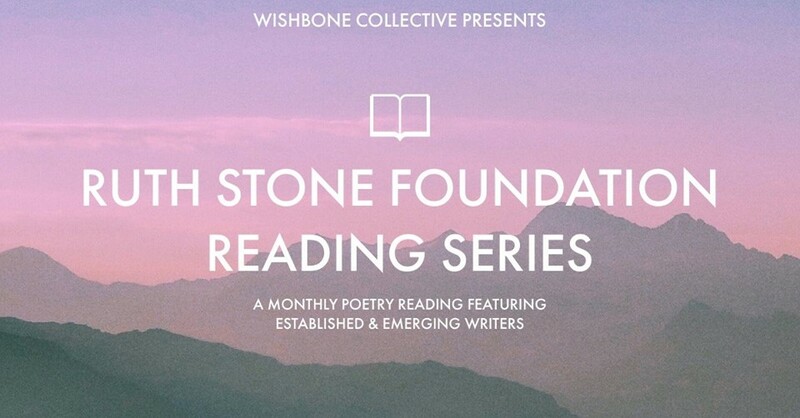 The Wishbone Collective (Winooski, VT) is happy to announce a new monthly reading series in collaboration with the Ruth Stone Foundation. Join us for our second reading on Sunday, April 14th. Doors at 6:00, reading at 6:30. 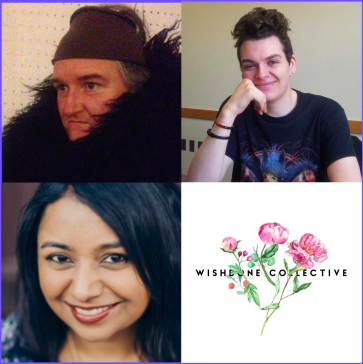 This month will feature poets Seth Wade, CA Conrad, and Rita Banerjee. Seth Wade studies English and philosophy at the University of Vermont. He’s been published in McSweeney’s and The Gateway Review, and is currently editor in chief of The Gist. CA Conrad is a 2019 Creative Capital Fellow, and the author of nine books of poetry and essays. While Standing in Line for Death (Wave Books), received the 2018 Lambda Award. A recipient of a Pew Fellowship in the Arts, they also received The Believer Magazine Book Award and The Gil Ott Book Award. Their work has been translated into Spanish, Greek, Polish, Norwegian, Portuguese, Danish and German. They teach regularly at Columbia University in NYC, and Sandberg Art Institute in Amsterdam. Rita Banerjee is the Director of the MFA in Writing & Publishing program at the Vermont College of Fine Arts. As a writer, she is the co-editor of CREDO: An Anthology of Manifestos and Sourcebook for Creative Writing (C&R Press, May 2018), and the author of the poetry collection Echo in Four Beats (Finishing Line Press, March 2018). The Ruth Stone Foundation (RSF) is a non-profit organization that not only looks to preserve and heighten Ruth Stone’s legacy, but also to provide poets and artists with time, space, and opportunities to create new work and share it with a wider audience. The RSF Reading Series is a free event featuring multiple poets, both emerging and established. As often as possible RSF will pair local authors with visiting writers and invite a student of the RSF Poetry Workshop to participate. Hosted by poets Bianca Stone and Ben Pease, these readings will offer a chance for out of state writers to engage with the local community, highlight exciting local voices, and give emerging writers a chance to share their work publicly. Rita Banerjee’s poetry debut Echo in Four Beats (FLP, 2018) has been selected for the Ruth Stone Foundation Book Club. The Ruth Stone Foundation will feature Echo in Four Beats on a podcast this Spring along with an interview of Banerjee this Spring. Established in 2013, The Foundation serves to fulfill Ruth Stone’s wish that her physical and literary estate would be used for the furthering of poetry and the creative arts. It was created not only to nurture contemporary poetry and art in its many forms, but also to cultivate and celebrate the works and legacy of the poet herself. The Ruth Stone Foundation seeks to provide poets and artists time, space, and opportunities to create new work and share it with a wider audience. This is accomplished through The Foundation’s small-press publishing house, the Next Galaxy Poetry Initiative (a writers’ retreat and haven, located in Ruth Stone’s house in Goshen, Vermont) and other programming in New York City. Compelled by Ruth Stone’s life and work, The Foundation seeks to support under-represented artists and stand for a literary community outside the usual institutions. The Ruth Stone Foundation connects the writers and artists it supports with the community at large, especially to empower women and foster leadership through creativity, writing, and publishing. 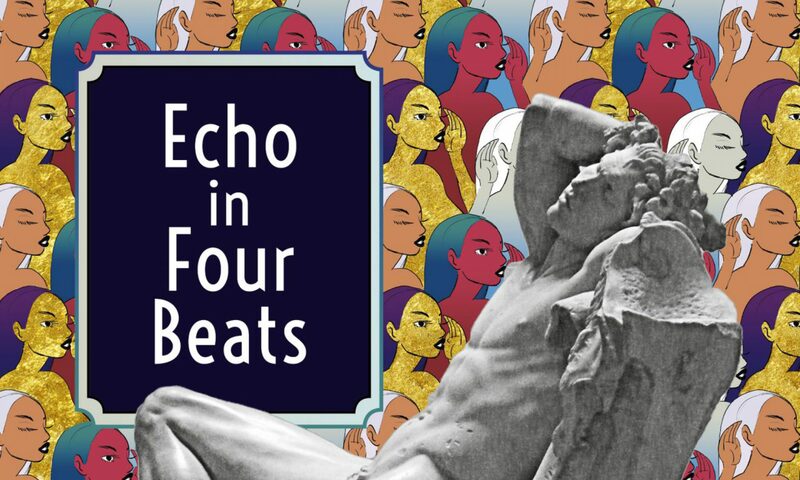 Combining elements, rhythms, and personas from American jazz, blues, and ragtime, poet Rita Banerjee presents a modern-day spin on the love story of Echo and Narcissus in her debut full-length poetry collection, Echo in Four Beats. But in this story, told in four parts, Echo is more than just a fragment, she is a Sapphic voice that speaks, foretells, forestalls, and repeats. Rita Banerjee’s Echo in Four Beats (March 9, 2018) is available for order on the Finishing Line Press website as well as at Barnes & Noble and internationally on Amazon.com. Hunger Mountain feat. Rita Banerjee’s essay “Birth of Cool” now available for order & at AWP 2019! This issue’s theme is sure to make you want to lean in and listen closely. Our guest editors—Natalie Scenters-Zapico, James Scott, and Yamile S. Méndez—have chosen amazing pieces for you, including new poetry by Paul Tran, W. Todd Kaneko, & Rosebud Ben-Oni, prose by Michael Martone, Tiphanie Yanique, Rita Banerjee, & much more. 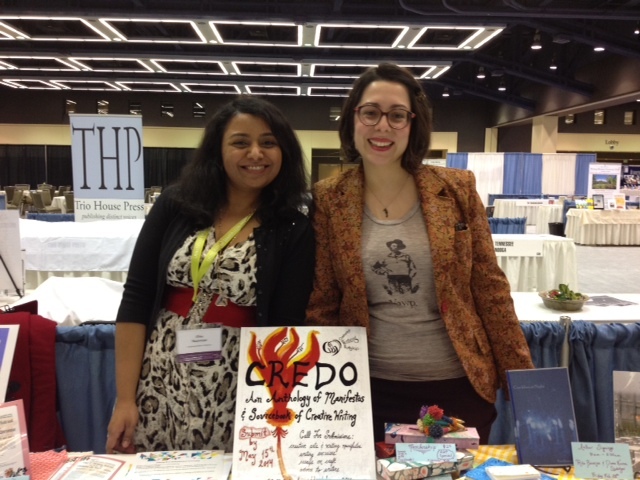 Hunger Mountain editors Erin Stalcup, Miciah Bay Gault, and Cameron Finch will signing copies of the new magazine and meeting with writers at AWP Booths 5021 and 5023 at AWP 2019 in Portland, OR from 1-2 pm on Friday, March 29. Stop by Booths 5021 and 5023 to pick up your copy of Hunger Mountain this week! 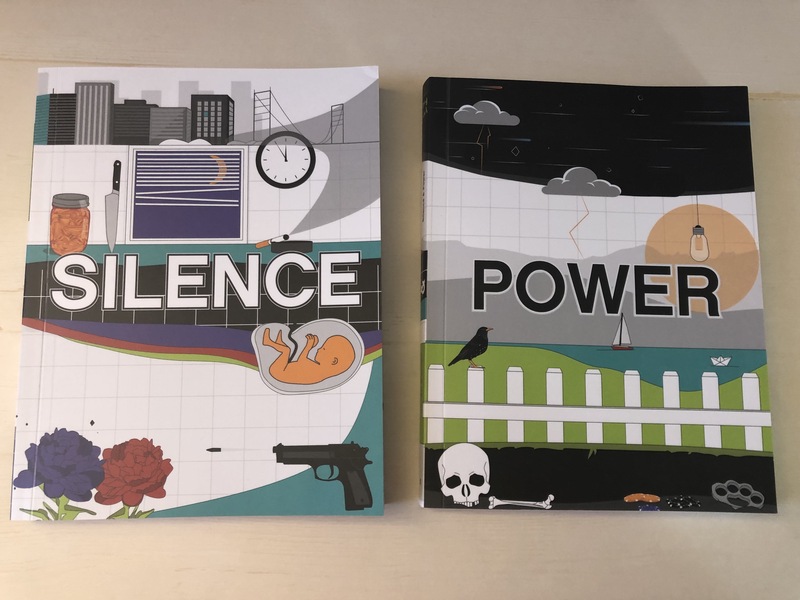 So preorder the magazine or get a copy of Hunger Mountain at AWP 2019!!! PREORDER NOW AND REDEEM HUNGER MOUNTAIN’S SPECIAL OFFER! The relationship between the writer and their practice is ongoing, and this collection feels like a generous gift to those who already write, those who may be dabbling, and those who may be completely stuck in either newness or crisis. In CREDO, this relationship the individual has with their act is explored via three different forms of writing-on-writing: manifestos, statements on craft, and writing exercises. Each section in the anthology contains contributions from different writers, fifty in all, who are connected to one another via the Cambridge Writers’ Workshop, an ongoing project which serves to “create a global network of creative writers, artists, and intellectuals who actively bridge their private aesthetic philosophies with their public forms of art.” The spread is, to some degree, diverse; the writers come from different styles and backgrounds and identities, and we see intricate and personal relationships between the writers and their works through the book’s three sections. To read the full review, visit Rain Taxi here. Dena Moes’s new memoir “The Buddha Sat Right Here” now available for pre-order! Dena Moes’s exciting new memoir The Buddha Sat Right Here: A Family Odyssey Through India and Nepal is now available for pre-order here. More than 5,000 high school students have participated in Poetry Out Loud in Vermont this year. During the March 18 Poetry Out Loud Championship, judges will review the performances of the 10 finalists, and choose three top-scoring student poets. Two of those students will receive cash prizes and poetry books for their school library. One of those students will move forward to a national competition in Washington, DC. Congratulations to #VT PoetryOutLoud State Champion Vera Escaja-Heiss & Runner-Up Sam Bulpin!! !